An historical, neo-Renaissance-style building that has been newly transformed from a former prestige seat of the chamber of commerce into a contemporary deluxe hotel named King�s Court with 135 guestrooms, unique conference facilities and ballroom, modern dining and special spa. 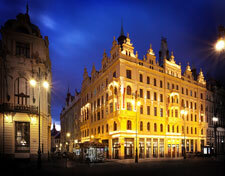 Enjoy royal and business treatment in the most inviting district in Prague downtown at one of the leading five-star hotels in the Czech Republic. Our design mEating Point Cafe-Restaurant has a great view on Republic square and large summer terrace. We serve here international cuisine and buffet breakfast. Taste!t restaurant is serving Scandinavian cuisine In our lively �vodka� lobby bar we can bring you the best vodka cocktails and snacks The cosy lounge with balcony is created to taste the best appetizers and desserts.